The latest political outfit of Mizoram, the Zoram People’s Movement (ZPM) chief ministerial candidate on Thursday said the party will not field any candidate in the two Chakma majority constituencies in the coming Mizoram poll as the larger interest of the people of Mizoram is not to field Chakma candidate. A pre-poll electoral alliance formed by various political parties and semi-political groups on Thursday hold a ‘Zoram Siamthar Khawmpui’ or ‘Reformation of Mizoram’ conference at Vanapa Hall in Aizawl. The event was also organised to mark its one year anniversary of an alliance. To mark its one year anniversary and kick off campaign, ZPM held an outdoor conference in Aizawl. Addressing the gathering, ZPM chief ministerial candidate Lalduhoma said that the main objective of the conference was to tell the people of Mizoram that change would come through ZPM. Lalduhoma also said the party is ready for campaign in all the villages and towns across Mizoram. He further added that ZPM would field candidates in 38 constituencies out of 40, with no candidates in two Chakma majority populated constituencies. Hundreds of ZPM supporters attended the conference held outside Vanapa hall, singing and dancing to gospel songs performed by local artist. Various leaders addressed the gathering. Elections to 40 Assembly seats in Mizoram are expected at the end of this year. The Election Commission is yet to announce the dates. 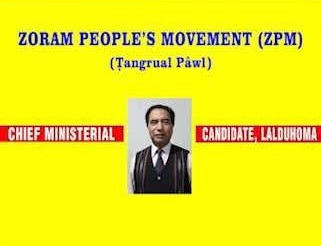 ZPM is an electoral alliance formed in August 2017 by political parties including ZNP, Mizoram People’s Conference, Zoram Exodus Movement, Zoram Decentralisation Front, Zoram Reformation Front, Mizoram People’s Party and Nationalist Congress Party.